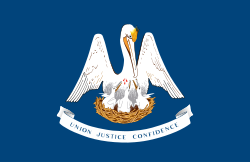 This is a list of law enforcement agencies in the state of Louisiana. ^ Heller, Laura (4 June 2015). "Off-duty Cameron Parish sheriff's deputy arrested on drug charges". KPLC. Retrieved 14 June 2015. ^ Moran, Lee (14 April 2015). "Louisiana sheriff's deputy arrested after drunken ride, crash in bayou patrol boat: cops". New York Daily News. Retrieved 14 April 2015. ^ Crain, Charles (17 March 2015). "Journalist arrested in Winn Parish". Winn Parish Enterpirse. Retrieved 22 March 2015. ^ "Police Department". Bossier City. Retrieved 22 December 2018. ^ "City Departments". Breaux Bridge. Retrieved 13 December 2018. ^ "Police department". Town of Brusly. Retrieved 17 December 2018. ^ Gunn, Billy (11 February 2015). "Former Carencro police officer indicted in probe of Desperado's". (Baton Rouge) Advocate. Retrieved 12 February 2015. ^ "Iota woman accused of dragging officer with vehicle, later attempting to take his gun". KPLC. Retrieved 25 December 2018. ^ Durrett, Clint (7 November 2015). "2 officer arrested in fatal shooting of 6-year-old boy in Marksville". WDSU. Retrieved 8 November 2015. ^ "Ville Platte Police detective accused of stealing from local business". KATC. 16 March 2015. Retrieved 20 March 2015. ^ HArris, Antwan (25 May 2015). "HANO officer gunned down in police cruiser". WWLTV. Retrieved 25 May 2015. ^ Jed, Horne (2006). Breach of Faith: Hurricane Katrina and the Near Death of a Great American City (Kindle ed.). 1797: Random House. ISBN 978-0-8129-7650-2.